Chainsaws are a powerful and effective piece of equipment to use when cutting trees and timber. Although very impressive in performance, it is extremely important to know how to be safe when using this potentially dangerous tool. So how can you operate a chainsaw safely? - Wear protective clothing and eye wear such as sturdy boots, long trousers and a hard helmet. Chainsaw chaps are also a great choice. They feature layers of Kevlar and a protective shell that work to stop the operation of the tool if it was to come in contact with the leg area. - Know how to deal with kickback, which occurs when the tip of the chainsaw bar strikes an unexpected object and forces the tool to quickly move upwards. This can be prevented by being aware of the position of the tool and having a firm two handed grip at all times during use. - Start the Chainsaw on the ground, preferably between your legs and have a strategy of how you are going to approach the objects you plan to saw. Make sure your area is clear of any obstacles before starting. We stock a great range of petrol Chainsaws for beginners and professionals with a variety of features and functions to save time while delivering great performance. 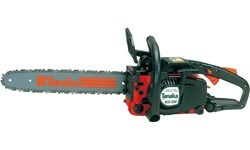 A great option for those who are new to using a Chainsaw is this Tanaka ECS 3351 with a 14" cutter bar. This product is easy to use and lightweight, making it perfect for domestic use. It's 33cc engine develops more power than larger chainsaw models and it features an adjustable flow rate bar so you can choose an option suitable for different jobs and wood types. The ideal product for saving time and effort with longevity guaranteed.